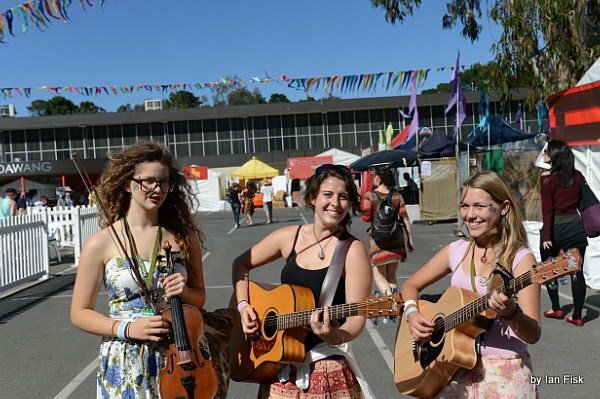 At the National Folk Festival, 2012. Image courtesy of The Miss Chiefs. The Miss Chiefs are Laura Zarb, Amelia Gibson and Vendulka Wichta from New South Wales and the Australian Capital Territory. Coming together at the National Folk Festival in 2012, they’re back together to perform at three folk festivals including a return to the National in 2013. I spoke with the three girls after an informal performance at The Artists’ Shed in Queanbeyan on Sunday 13 January 2013. The audio file is below and the text will appear this week on the Timber and Steel nu-folk blog. AND be sure to check out the official video below of The Miss Chiefs performing ‘Hallelujah’ at last year’s National. Apologies if you’re seeing an error message in the Soundcloud box above. The servers went down due to a load balancing error several hours ago and the techs are still sorting it out. To complete my tech challenges, my phone won’t let me get to the text above to change it. These things are sent to challenge us, and this too will pass!